A coin is a metal token, usually in the shape of a disc, often of a specific weight and value, and most commonly issued by a government. Coins are used as a form of money in transactions of various kinds, from the everyday circulation of the United States quarter, to the storage of vast amounts of bullion. Coins can be stamped with various designs and inscriptions as a guarantee of its exchange value. Coins made for circulation, or general monetized use, are usually used for lower-valued units, while banknotes are often issued for higher values. In most money systems, the highest value coin is worth less than the lowest-value note; additionally, the face value of circulation coins is usually higher than the gross value of the metal used in making them. Historically, a great number of coinage metals, including alloys, and other materials have been used practically, impractically, artistically, and experimentally in the production of coins for circulation, collection, and metal investment. Materials have included gold, silver, nickel, bronze, copper, aluminum, or a combination of such metals. Forms of money have developed from coins made from precious metals, to base metal fiat currency, to the paper money that is commonly used today. Yet, coins are still produced in great abundance and have many uses. The rise of coin-operated machines in the increasingly automated society is an example. Thus, the invention of coins can be seen as a great advance in human society, one that has already served for millennia and continues to be of value to human society. One of the earliest coins, an early seventh century B.C.E. one-third stater coin from Lydia. Many archaeologists believe independent coinage to have originated in the seventh century B.C.E. among the early peoples of Lydia, the Aegean islands, or China. The question of the world's first coin if often debated; while it is believed by many historians that the Lydian Lion trite is the world's oldest coin, some argue that India's karshapanam holds such a title. Other historians argue that Indian coins were developed from Western prototypes, which the Indians came in contact with through Babylonian traders. Despite the debate, the most widely held belief is that the world’s first coins were minted in Lydia between 643 and 630 B.C.E. These coins were made of electrum, a naturally occurring yellow mixture of gold and silver, and were stamped with simple designs, markings, and later, inscriptions. Early coins contained no writing but often depicted the silhouettes of symbolic animals. A portion of these coins were found buried under a Lydian temple dating from the sixth century B.C.E. ; as such, these coins are believed by many historians to have been used in ceremonial exchanges and not in everyday trade. The majority of coins recovered from this area are believed to have been manufactured under King Croseus. Early Roman coins, dating back to the third century B.C.E., were minted first in precious metals but later in bronze and silver. Throughout the Chinese Zhou Dynasty, shells and other small particulars were used for trade and barter, replaced in the third century C.E. by the use of holed, round coins. Macedonian leaders Phillip II and Alexander III introduced similar coinage practices to remaining mainland Europe in the fourth century C.E. ; many of these coins included facets of Celtic art. By the start of the fifth century C.E., many historians believe various coinage practices reached India by means of Persian trade contacts; early prototypes belonged to both the Mauyan and Kushan peoples. In the sixth century C.E., under Cyrus the Great Lydian coinage abandoned electrum in favor of gold; many of these coins depict a portrait of the King. This design was copied by the seventh century C.E. Greeks of Asian Minor. The first cast of copper money was recovered from a tomb of the Shang Dynasty and is believed to date back to the eleventh century B.C.E. Early coins of the Byzantine Empire include thin gold coins bearing the image of the Christian cross and various Byzantine emperors. Ancient coins were often produced using a hammer and anvil surface; early coins minted in the U.S. were often die-struck by hand until the establishment of the first U.S. mint in 1792. In the mid-sixteenth century, coin production showed vast improvements with the introduction of the mill and screw machine which helped to standardized coin production worldwide. Since the early 1700s, various minting presses have been used to craft coins, beginning with screw presses and progressing, in the 1800s, towards steam driven presses. Since the seventeenth century, milled or lettered edges were imprinted on many coins to discourage the devaluing of gold and silver coins by shaving. Coins with milled edges showed that none of the valuable metal comprising the coin had been removed from the coin. Prior to the use of milled edges, many un-milled British sterling silver coins were known to be shaved to almost half of their minted weight. This form of debasement in Tudor England led to the formulation of Gresham's Law; under this law, the monarch would periodically recall circulating coins, paying only bullion value of the silver, and re-mint them. Modern minting techniques often involve electric and hydraulic presses. Contemporary coins are usually stamped from rolled mental blanks, then milled; designs impressed upon the coins are the result of coining presses. Over time, various governments have opted to abandon particular coinage materials. Since 1934 and the abandonment of the U.S. domestic gold standard, U.S. coins have ceased to be made from gold; in 1965, the U.S. mint abandoned silver. In the mid-1990s, the European Union (EU) adopted a common currency, known at the Euro; inaugurated in 1999, Euro coins and notes were circulated throughout the EU, entirely replacing the former currencies of most EU members. In 2004, Canada introduced the first colored coin, a quarter featuring a colored poppy. 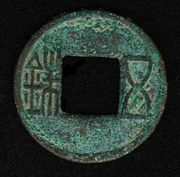 A bronze coin (5 Zhu, 五銖) of the Chinese Han Dynasty, circa first century B.C.E. Although in the past many coins were made of valuable metals, today most coins are made of a base metal, their value coming from their status as fiat money. This means that the value of the coin is decreed by government law, and is determined by the free market. This causes such coins to be monetary tokens in the same sense that paper currency is; though paper currency is not backed directly by metal, it is supported by a government guarantee of international exchange of goods or services. Because fiat money is backed by a government guarantee, and its value determined by the free market, in practice there is very little economic difference between the two types of money. Sometimes, coins are minted that have fiat values lower than the value of their component metals. This is often due to inflation, as market values for the metal overtake the fiat declared face value of the coin. Before 1964, examples of this phenomenon included the U.S. dime, quarter, half dollar, and dollar; also included is the U.S. nickel, and the U.S. penny before 1982. As a result of the increase in the value of copper, the United States greatly reduced the amount of copper in each penny. Since 1982, United States pennies are made of 97.5 percent zinc coated with 2.5 percent copper. Extreme differences between fiat values and metal values of coins can cause coins to be removed from the market by illicit smelters interested in the value of their metal content. In fact, the United States Mint, in anticipation of this practice, implemented new rules in 2006, which criminalize the melting and export of pennies and nickels. Violators can be punished with a fine of up to $10,000 and imprisoned for a maximum of five years. To distinguish between the types of coins, as well as from other forms of tokens which have been used as money, some monetary scholars have attempted to define a true coin by three criteria. Firstly, it must be made of a valuable material, and trade for close to the market value of that material. Secondly, the coin must be of a standardized weight and purity. Finally, it must be marked to identify the authority that guarantees the content. Throughout history, governments have been known to create more coinage than their supply of precious metals would allow. By replacing some fraction of a coin's precious metal content with a base metal, often copper or nickel, the intrinsic value of each individual coin can be reduced, or debased. This allows the coining authority to produce more coins than would otherwise be possible. Debasement may also occur in order to make the coin harder and therefore less likely to be worn down over time. Debasement of money almost always leads to price inflation unless price controls are also instituted by the governing authority. In the study of numismatics, token coins or tokens are coin-like objects used in place of coin currency. Tokens may have a denomination shown or implied either by size, color, or shape. They are often made of cheaper materials than the precious metals of coins, and can include copper, pewter, aluminum, brass, and tin, though bakelite, leather, and other less durable materials may also be used. The key point of difference between a token and a coin is that a coin is often issued by a local or national authority and is freely exchangeable for goods or other coins, whereas a token has a more limited use and is often issued by a private company, group, association, or individual. The first set of Strachan and Co currency tokens - recognized as South Africa's first indigenous currency. Currency tokens, or tokens issued by a particular company or individual that are sanctioned by a local government, may also serve as a particular form of currency. The issuance of currency tokens may result from a severe shortage of money or a government’s inability to issue its own coinage. In effect, the organization crafting the sanctioned currency tokens may serve as the regional bank. One example includes the recognition of trade tokens of Strachan and Company, issued in South Africa in 1874 which, today, are considered the country's first circulating indigenous currency. Currency tokens may also be issued in times of high inflation. An example of this includes former Italian and Israeli telephone tokens which could be used for one telephone call despite consistent inflation of prices. Under some circumstances, New York City subway tokens could also be accepted in trade, or used in parking meters as the tokens contained a set value. Aluminum trade token from Osage,Kansas. From the seventeenth to the nineteenth centuries throughout the British Isles and North America, barter tokens, or trade tokens, were commonly issued by traders in times of acute currency shortage. Under such circumstances, barter tokens enabled trading activities to proceed. The token was, in effect, a pledge redeemable in goods but not coins. Though the tokens never received official sanction from government authorities, they were widely accepted and circulated. In seventeenth century England, the production of copper farthings was terminated during the English Civil War and a great shortage of small change resulted. This shortage was felt keenly due to the rapid growth of trade in small towns and cities; this, in turn, prompted both local authorities and private traders to issue tokens. These tokens were most commonly made of copper or brass, though pewter, lead, and occasionally leather tokens were issued. Most were not given a specific denomination and were intended to pass as farthings. Thousands of towns and traders issued these tokens between 1648 and 1672, when official production of farthings resumed and private production was suppressed. 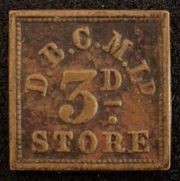 Brass trade token from Fort Laramie, Dakota Territory. 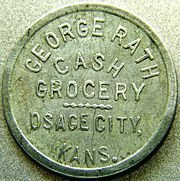 Types of merchants that issued tokens include general stores, grocers, department stores, meat markets, drug stores, saloons, bars, taverns, barbers, coal mines, lumber mills, and various others. The era of 1870 through 1920 marked the highest use of "trade tokens" in the United States, spurred by the proliferation of saloons, billiard halls, bakeries, and general stores. Trade tokens may also be issued by a government for members of a military. Because of their weight, the U.S. Treasury Department does not ship coins to the Armed Forces serving overseas. Instead, officials of the Army and Air Force Exchange Service often make trade tokens, known as pogs, in denominations of 5, 10 and 25 cents. The pogs are about 38mm in diameter and feature various military-themed graphics. Metal token coins may also be used in lieu of cash in some casino slot machines. Money may be exchanged for the token coins or chips at any casino cage, gaming table, or slot machine, or at a cashier station for slot token coins. These tokens are often interchangeable with money at the casino; generally the tokens have no value outside out of the casino. In the United States, after the increase in the value of silver stopped the circulation of silver dollar coins around 1964, casinos rushed to find a substitute, as most slot machines at that time relied heavily upon the coin. The Nevada State Gaming Control Board, consulting with the U.S. Treasury, soon allowed casinos to start using their own tokens to operate slot machines. In many jurisdictions, casinos are not permitted to use currency in slot machines, necessitating tokens for smaller denominations. More recently, tokens are being phased out of many casinos in favor of coin-less machines which accept banknotes and print receipts for payout. Under some circumstances, staff tokens may be issued to the staff members of businesses in lieu of coins. In the United States during the 1800s, the argument supporting token payment to staff members was the shortage of coins in circulation; in reality employees were often forced to spend their wages in the company store at highly inflated prices. This resulted in a dramatic lowering of the employee’s actual salaries and disposable incomes. Railways and public transportation agencies often use fare tokens to sell public transportation rides. Businesses such as car washes, video arcades, and parking garages also make use of such coins. Various commemorative coins may also be produced with no monetary value to distribute by a company, country, or organization. Historically, various church organizations gave tokens to members passing a religious test prior to the day of communion; the token was required the next day for entry to the services. While this practice was mostly used in Scottish Protestant churches, some U.S. churches issued communion tokens. Generally, these were pewter, often cast by the minister in church-owned molds. Replicas of these tokens have more recently been made available for sale at some of the churches that formerly followed this practice. Coin collecting is the collecting or trading of coins or other forms of legally minted currency. Frequently collected coins often include those that were in circulation for only a brief time, those that are considered rare because they were only minted for a short time, coins that were minted with errors, or foreign coins. Though both are closely related, coin collecting as a hobby can be differentiated from numismatics in that the latter is the scientific study of currency. The most famous and widely collected coins of antiquity are ancient Roman coins and Greek coins. Non-monetized bullion coins, made of silver or gold, or, rarely, other metals such as platinum or palladium are often intentionally produced for collectors or investors of precious metals. Examples of modern gold collector coins include the United States American Gold Eagle, the Canadian Gold Maple Leaf, and the South Africa Krugerrand. The U.S. Eagle coin has a face value of ten U.S. dollars while the Double Eagle has a face value of twenty U.S. dollars. The Canadian Gold Maple Leaf also has nominal face value, though the Krugerrand does not. In terms of its value as a collector's item, a coin is generally made more or less valuable by its condition, historical significance, rarity, beauty and general popularity with collectors. If a coin is deeply lacking in any of these, it is unlikely to be worth much. Bullion coins are also valued based on these factors, but are more so valued on the gold or silver comprising them. Many societies believe damaged coins, such as those bent or minted with an irregular marking, are believed to be lucky. In particular, holed coins produced throughout the 1830s until the 1950s in England were often collected by various shopkeepers, soldiers, or generally superstitious individuals in the belief that they carried good luck. Bent coins, such as the crooked sixpence of the nursery rhyme "There Was a Crooked Man," were also considered to bring luck to the individual who held it. In Medieval Great Britain, coins were often intentionally bent to be offered as gifts, when taking a vow, or as part of a cure. These coins were often offered to a saint in order for the intended purposes to take place. A widespread practice continues to exist in which a coin in placed under the mast of any new boat in order to bring the vessel good luck. A coin was often placed in the mouth of a dead person as payment to Charon for passage across the river Styx to the world of the dead. In Greek mythology Charon, the ferryman of Hades, charged the newly deceased for passage across the river Styx to the world of the dead. Therefore, a coin was often placed in the mouth of a dead person as payment to Charon. Traditionally, the side of a coin carrying a bust of a monarch or other authority, or a national emblem, is often called the obverse side, or heads. The other side may be called the reverse, or tails. This is however an exception for some Chinese coins, most Canadian coins, the British twenty pence coin, and all Japanese coins. The orientation of the obverse with respect to the reverse differs between countries. Some coins have coin orientation, where the coin must be flipped vertically to see the other side; other coins, such as British coins, have medallic orientation, where the coin must be flipped horizontally to see the other side. The exergue, or the space on a coin beneath the main design, is often used to show the coin's date, though it may also contain a mintmark, privy mark, or left blank. Coins that are not round usually have an odd number of sides, with the edges rounded off. This is so that the coin has a constant diameter, and will therefore be recognized by vending machines. Coins can also be popularly used as a sort of two-sided die in order to choose between two options with a random possibility. One choice may be labeled heads and the other tails; a fair coin is defined to have the probability of heads of exactly 0.5. However, coins can be falsified to make one side weigh more than the other. Such weighted coins may produce an abundance of heads or tails for an individuals’ particular advantage. Other coins include bracteate which are made so thin that they can only be struck on one side. Bi-metallic coins, or coins comprised of two metals, are sometimes used for higher values and for commemorative purposes; in the 1990s, France used a tri-metallic coin. Common circulating examples of bi-metallic or tri-metallic coins include the €1, €2, British £2 and Canadian $2. Coins can also come in various shapes and sizes; guitar-shaped coins were once issued in Somalia, Poland once issued a fan-shaped 10 złoty coin, and in 2002 Nauru issued a 10 dollar coin shaped in the form of Europe. Forms of money have developed from various items of actual value, to coins of valuable metals, to fiat versions comprised of base metals, and finally to the paper money widely used in the twenty-first century. As such, one may expect past monetary forms, such as coins, to become obsolete. Though paper money may often be considered more convenient, there still exists an essential need for coins. Because of this need, the future of coins and their continued use and existence appears bright. ↑ A Case for the World's Oldest Coin: Lydian Lion. Retrieved July 22, 2015. ↑ The Columbia Electronic Encyclopedia, Coin. Columbia University Press, 2012. Retrieved July 22, 2015. ↑ United States Mint Moves to Limit Exportation & Melting of Coins, The United States Mint Pressroom, Retrieved October 16, 2007. ↑ Unusual coins, Fleur-de-coin.com. Retrieved July 22, 2015. A Case for the World's First Coin: The Lydian Lion. Retrieved October 16, 2007. Darvill, Timothy (ed.). The Concise Oxford Dictionary of Archaeology. Oxford University Press, 2008. ISBN 9780199534043.
Cooper, Denis R. The art and craft of coinmaking. A history of Mining Technology. London: Spink, 1988. ISBN 0907605273. Stevenson, Jed. COINS; A Modern Twist For Church Tokens The New York Times, April 11, 1993. Retrieved July 22, 2015. CoinFacts.com - The Internet Encyclopedia of US Coins - Free information on United States Coins, including pricing, rarity, and historical information. CoinWeek - Coin news, Directory of Numismatic sites. A reference site on AAFES pogs: tokens currently in use by US armed forces overseas. This page was last modified on 23 May 2017, at 21:06.